Full-featured digital-based (LCD-digital display force gauge with integral keypad) dual-purpose Friction Tester which can be run as a stand-alone machine or a computer-assisted tester with optional FX-7200 Quality Control Software for automatic calculation and graphical display of static, kinetic friction, peel, seal, and other test data. 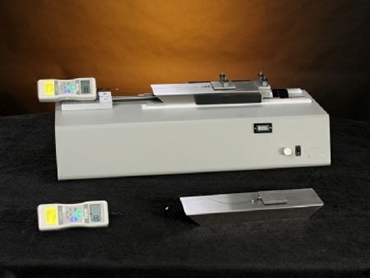 Variable speed sled, with speed range from 1 to 20 inches per minute, meeting ASTM D 1894. Reversible-direction motor allows higher force testing for COF, Peel, Seal and Tensile up to 45 lb (20 kg) force. Economically priced, resulting in fast payback of your investment. 200 gram force scale standard; add a second force scale (optional) with measurement ranges including 500 gram, 1 kg, 2 kg, 5 kg or 20 kg for dual-purpose test capability. Manual mechanical grips included. Ideal for use with benchtop heat sealers for seal strength testing.